Today is another down-day for the US dollar, the third in a row, capping a nasty year for the dollar, the worst since 2003. In 2017, the dollar dropped 7% against a broad basket of other currencies, as measured by the Trade Weighted Dollar Index (broad), which includes the Chinese yuan which is pegged to the US dollar. It was worse than the 5.7% drop in 2009, but not as bad the 8.5% plunge in 2003. This broad Trade Weighted Dollar Index is a weighted average of the dollar against the currencies of major US trading partners: the Eurozone, Canada, Japan, Mexico, China, UK, Taiwan, Korea, Singapore, Hong Kong, Malaysia, Brazil, Switzerland, Thailand, Philippines, Australia, Indonesia, India, Israel, Saudi Arabia, Russia, Sweden, Argentina, Venezuela, Chile, and Colombia. Among the largest currencies, the euro rose the most, soaring 14.5% against the dollar in 2017 and is currently trading at $1.20. The Canadian dollar is up 7% against the dollar, the Japanese yen nearly 4%. As per the narrower Dollar Index [DXY], the dollar fell 10.2% for the year. The DXY measures the dollar only against the euro, Japanese yen, Canadian dollar, British pound, Swedish krona, and Swiss franc, but not against the currencies of other major US trading partners, such as China and Mexico. Thus the dollar has accomplished a feat in 2017: During a year when the Fed continued with clockwork regularity its efforts to raise interest rates “gradually,” and when it kicked off the QE Unwind, thus taking dollar liquidity out of the market, the dollar, instead of rising in response, had its worst year since 2003. In the second half of 2016, the Fed signaled fairly clearly that it would get serious about raising its target range for the federal funds rate. In the fall of 2016, Fed governors started suggesting that the QE unwind would need to start in 2017. So when the Fed raised rates in December 2016 for the first time in a year and for the second time in 10 years, there was absolutely no surprise. Markets had expected it. 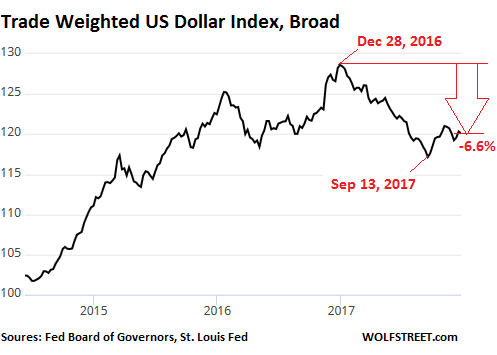 And foreign currency traders had driven up the dollar in advance: From May 2016 through the end of 2016, the broad Trade Weighted Dollar Index jumped about 9% and the DXY 10%! This move in the dollar was paralleled roughly by the move in 10-year Treasury securities, whose yield, after falling to a historic low of 1.37% in early July, soared in the second half, nearly doubling to 2.6% by the end of the year. Then, having successfully front-run the Fed’s actions in 2017, it was time to take some money off the table. As 2017 dawned on the markets, the dollar and 10-year Treasury yields both fell, despite the Fed’s consistent tightening. These moves have only encouraged the Fed. Had the dollar skyrocketed in 2017, and had long-term yields soared in response to the QE unwind, in a replay of the Taper Tantrum, some Fed governors might have felt a little queasy about their new monetary policies. But the opposite happened. Where does this leave the dollar for 2018? I think much of the damage to the dollar exchange rate against other currencies has been done. The new Fed will continue to tighten, possibly in a more hawkish manner than in 2017. And the QE unwind is scheduled to pick up pace automatically, as announced in September. In Q1, the cap for the monthly balance sheet reductions doubles from $10 billion in October, November, and December, to $20 billion a month. In Q2, it increases to $30 billion a month; in Q3 to $40 billion a month; and in Q4 to $50 billion a month. In total for 2018, the QE unwind is capped at $420 billion. This will rise to $600 billion in 2019. It represents a lot of dollar liquidity scheduled to disappear from the markets. Nothing like this QE unwind has ever happened before in US history, so the results could vary, as they say. The dollar is likely to respond to this tightening US monetary environment in 2018 with a bounce, especially given the sell-off in 2017 following the front-running in the second half of 2016. And if markets suddenly come to the realization that tightening is real and will continue, which they haven’t yet, the bounce in the dollar – along with long-term yields – could happen abruptly. I have read and heard in recent years that the FED’s REAL GOAL is to decrease the Dollar’s value. Not saying I agree or disagree. But, the Dollar’s stubborn rise about a year ago was being seen by those who see the FED’s real agenda, as fighting the FED. Reality has its own agenda. I personally have seen a negative coloration between how well my industry does and the value the dollar. I think the is a conflict between US Industry and US capital. A weaker dollar favors industry, but a stronger dollar make it’s easier for US capital to invest abroad. Key thing, they often invest in dollar denominated assets. The protects them from currency swings which would otherwise murder their portfolio’s otherwise. I think the is a conflict between US Industry, and US $ Denominated Capital. An awful lot of that “US $ Denominated Capital” is not US Domicile and does not have the Interests of the US, or its Citicens a Heart. The constant suppression of the USD encouraged foreign money to be spent or invested here. Americans never get the benefit of the foreign exchange rates when they travel abroad. The Fed doesn’t want the American middle class to gain anything other than further indebtedness to the system that manipulates us all. Let’s see, the U.S. is cutting tax revenues, while proposing huge spending increases on things like “infrastructure” (congressional vanity projects), huge increases to military pork barrel spending, border walls (is that infrastructure?) and etc… We are told this new gusher of government spending is patriotic and those who oppose it are traitors – so best just go along with it. The deficits come first, the money printing follows. The Fed may say they are tightening now but it’s pretty obvious how these deficits will be paid for in the end – and it’s not good for the currency. All of this nonsense gives working Americans two choices for investing their savings 1) put your money into the largest asset bubble in history and possibly lose 80% in the crash or 2) put your money in a bank and lose it all to inflation over time. During congressional testimony Bernanke showed disdain for people trying to save (he has referred to them as hoarders). Indentured servitude is the plan for the masses – living off savings is free-loading in their eyes. What becomes of the wealth earned through hard labor? Wage earners are fleeced – the fruits of their labor siphoned off by the banking system, the government and central banks. The game is rigged. Common fallacy: A strong dollar is good and a weaker dollar is bad. Not true, even a little. A strong dollar makes imports cheaper and exports more expensive. A strong dollar makes shoppers in other countries more likely to shop elsewhere than the US. A weaker dollar makes US exports more competitive and imports more expensive and is more likely to be good for GDP by increasing exports. This is basic econ 101. Also, raising rates makes the dollar more attractive, especially when much of the rest of the world has negative rates forced upon them. This is why raising rates causes the dollar to rise in value …. it’s in higher demand for investment purposes. What’s unclear is why the yen and euro have much value at all. I expect them to weaken a lot if the joint central bank efforts at currency parity by world wide money printing ends when the Fed reducing its balance sheet. One needs to be globally diversified, in dollars, and other assets (RE), in multiple currencies….thus any storm is just the prelude to sunnier days ahead. Low dollar, high dollar….it’s all good. Good plan. I’m looking into buying an avocado farm in Mexico. Of course, if either the Mexican government or narco-terrorist decide they want either the land or protection money I’m screwed – thus the importance of being diversified. My problem is I have less than $1 million so if I spread it around to diversify the little piles of money are too small to invest, so I’m forced to make my bets and either win or lose (small fries like me generally lose). Don’t buy Canadian dollars the Canadian dollar is set to plunge with a capital P in 2018 AFTER (it will rise on the report that’s when to short it) the December jobs and unemployment report. Its my top pick for 2018 that and shorting marijuana stocks which will fall like the old stemcell era and we all remember what happened to stemcell stocks. cdr, there are two things that determines “prices”. Market as a “price discovery” or the guys with guns come in and set the price. So when you think about any prices, short rate of local currencies, long rate or local currencies, cross rate of international currencies, you have to ask yourself is the market “discovering it” or somebody with guns set it. I guarantee you for the past 8 or 9 years, it is the guys with guns. 2 Weeks after Trump was elected, he twitted he will get a good deal of US treasury. The world gets nervous and he twitted again “Inam not saying we will default, what I was saying is that rate will rise and existing debt with lower treasuries will be worth less so I get a good deal”. So rate rises. Then there is MAGA, buy US stuff, punish every countries that runs trade surplus to US. This is NOT only China, Canada was name called and negotiated. So I think we can forget about what Market thinks or wants. We can just twitter follow the guys with guns. Then the world suddenly makes sense. BTW, the FED’s job is NOT ease or tighten. Their job is to protect the interest of the guys with guns. If deflation risks threatens the business of the guys with guns, they will tighten. If the inequality is stretched to the point of social issues, they will tighten. No more econ 101, no more markets. Market has changed from a price discovery tool to coordinate business activity INTO a political agenda tool. I agree. I’m not a wizard, but the US is completely rigged. They left no area unrigged. For example, look at farmland…..extremely difficult to produce product and sell it fairly due to monopolies. Research the raisin industry in CA for info on this. From my modest perspective, the “investors at the top” have succeeded in controlling everything up to now. It seems to this observer that the real changes come with the Belt and Road Initiative. Add to that the Moscow Gold Exchange. That’s why I support PM’s as investment…not much to see in the US as encouragement for a small player. You sound like an old fashion mercantalist. not really. I only described basic econ theory. Almost textbook. Mercantilism is one way to react to the theory. My personal opinion on what happens eventually is more a new theory based on applied fraud, with various excuses postured as economics. Class warfare is one part of the result, rather than mercantilism. One thing missing from your analysis is US consumers. In fact you committed the most basic of all fallacies i.e. what’s good or bad depends on the eyes of the beholders. Therefore in anything some people will be hurt and others will benefit. The US economy is 70% driven by consumption. No doubt bleeding heart liberals love those downtrodden people overseas, and they still can’t understand why Trump won. Actually, you miss the point completely. Please explain how it’s good for US consumers to pay 5 dollars for a given thing as opposed to let’s say 3 dollars. During the 70s, the dollar was still strong and it coincided with a time of peak middle class prosperity. Please explain that. Just saying someone is missing the point means you are already losing the point. There are two sides to this coin I reckon. Suppose I want a new BMW motorbike (which is true); the exchange rate of the euro vs. dollar should be a factor in the cost to me in Minneapolis. Strong dollar = lower cost. Suppose I want a new Indian motorbike which is made in Spirit Lake, Iowa; the exchange rate of the euro vs. dollar should not be a factor in cost. But a weak dollar makes the Indian more attractive overseas, it should ramp up production, lower the cost of production via economies of scale, boost the economy and tax base in Iowa and increase profit to Minnesota’s Polaris Industries which is the parent company. All of which doesn’t really matter right now as my Kawasaki motorbike sits in my garage and it’s -25 C outside. I do agree with cdr though, and the strong dollar has had an affect on grain prices which hurts the bottom line of farmers in the U S.
nowhere does it say anything is good or bad. It’s basic economic 101 theory from any textbook. International economics covers the same stuff in more depth – a couple of chapters or more. I described the equivalent of gravity. BTW, if the US has a strong dollar and imports a lot and attracts a lot of foreign currency due to high rates (the other definition of a strong dollar) … the other side of the coin in it costs more to borrow and domestic jobs go away because imports are substitutes for domestic production. This isn’t ‘my theory’. It’s basic econ in any textbook not written by a kook. A weak dollar means our export are booming and demand for dollars is weak due to lower rates. Domestic jobs are strong due to strong exports but out cost of living rises because imports cost more. Again, econ 101. Today, for the past few year, it’s my belief that world central banks tried to ‘beat the system’ by printing out of control in unison … in parity to each other. Thus, the weak / strong relationship goes away while interest rates and prices both fall and money printing is used to monetize debt as a replacement for investment of savings in return for interest income. The eurozone depends on this plan now to exist. 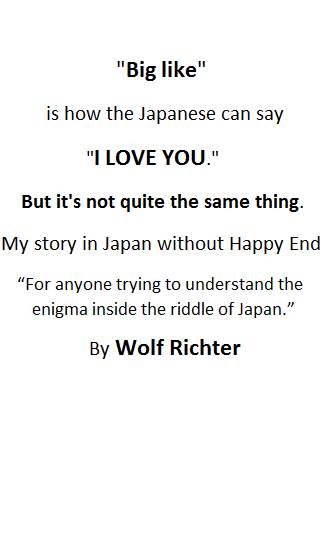 Japan is doing it because they think they’re getting away with something. China does it to maintain social order. The Swiss do it to buy equities with printed money. The US is possibly going back to normal, tossing a monkey wrench in the world economic order. also, be aware that it’s normal and considered self correcting. A weak dollar attracts domestic investment because costs are low relative to the foreign currency. This creates domestic jobs. As the demand for dollars increases, the dollar becomes stronger and rates rise due to supply and demand for dollars. Eventually the dollar becomes too strong and exports drop. Hence, a repeating cycle. Imagine a sine wave. In a normal world, that’s a graphical representation of currency strength and weakness over time. We DO NOT have a normal world today due to central banks in unison attempting to print a new world order, replacing investment with debt monetization and asset inflation, creating abnormally low rates and deflation as a byproduct. The way you worded your initial statement implied that the opposite is true i.e. a weak dollar is good and a stronger dollar is bad. And now you are basically arguing my point above i.e. good or bad is a matter of the beholders. people like you with literacy issues make me wonder why I even try. If you can’t get past simple text, it’s unrealistic of me to expect you, any probably lots of others, to grasp something abstract as exchange rates from a text book or the central bank fake economics from plain sight. The value of a country’s currency is like the value of a share in a company. If the country is performing well their currency goes up and vice versa. If there is no confidence in the country, there is no confidence in their currency and it collapses in value. Deliberately lowering the value will, as you say, make exports more competitive; but it does so by paying less for labor inputs, which decreases the purchasing power of employees. It also can lead to currency wars, where each country tries to cheapen the value of their goods and services by pursuing policies to lower their currencies, in response to other countries doing just that. Why bother producing or exporting anything but dollars, if a strong dollar allows you to buy everything you need? Why save any dollars if they become worth less over time? A weakening dollar (inflation) lets you pay back debt with interest. You dont see to be familiar with the meaning of “Ever closer union”. Its been on the Agenda by “Stealth” Since The EU became The EU. One of the reasons the Eur came into existence, out of ,without first banking or fiscal union. Is that the Warmongering tribes of Europe. France being the worst, will not give up their sovereignty without force. Sovereignty with out fiscal self determination, is incompatible. The EUR was deliberately, brought in out of sequence, to FORCE the Tribes of Europe together “Ever closer union”. The Ignorance and Arrogance of the “Totalitarian Leftist’s” In Brussels in 2008. Who pushed more Europe (ECU) instead of quietly stepping back and waiting as the GFC played out have “Blown ” ECU for decades, if not For ever. The EU in its current configuration Must sort out border it protection and enact strict “illegal immigration policy” to deal with “Illegal Economic Migrants (who claim to be refugees)” along with resolving the flaw’s in the “Freedom of Movement policy’s'”. Should it not resolve these issues to the satisfaction of the rising Xenophobic Right. It will tear apart. Brexit is a Symptom of this. The rise of the Xenophobic Right. And,the Outright Refusal of the Eastern States to accept a mandated “Quota” of “Illegal Economic migrants” is a direct result of the Failed “illegal immigration policy” to deal with “Illegal Economic Migrants (who claim to be refugees)”. And you have Unite/federated EU by 2020. More likely at this stage 2200, if ever. As England is not going to supply the most Money and Manpower, After the US, to NATO. With out a very good trade deal. NOW. Not in 10 or 20 years time, after the EU has DELIBERATELY (Just as De Gaul did) inflicted as much damage as it can on the Economy of England..
Trade and security have always been left and right hands. The “Totalitarian Leftist’s” In Brussels. Seem to think they can cut off the Trade hand. Yet keep the free security hand. Some “Totalitarian Leftist’s” groups, have a very warped sense of reality. Something very similar occurred 80 years ago, or one complete Kondratiev cycle. The country experienced a deepening of the depression, within the ongoing depression, as the Fed prematurely tightened. From 1934 to 1937 the economy was showing signs of healing and coming back to life. The Fed in their wisdom became fearful and began withdrawing liquidity, causing the economy to go into a tail spin. From which it did not recover until the outbreak of World War two. History may not repeat, but it sure seems to follow similar patterns. 2014 – 2017 = 1934 – 1937 ??? You be the judge. You forgot about the Federal tax increase in 1937. The continuing depression was caused by both tighter monetary AND fiscal policy. Roosevelt exclusively raised taxes on the rich during the so-called Roosevelt Recession but also cut back on spending in government programs due to inflationary expectations. He also mistankenly thought that the Great Depression was over or at least in the final stages during this timeframe. And there is a huge difference today compared to ’34–37, ie the federal debt and the total debt of the country back then was nothing compared to today’s level. Another difference back then was that the USA was a manufacturing powerhouse while manufacturing today has been to a too high degree outsourced outside of the USA. It might just be the “Business Cycle” that is bound to occur regardless of US Gov’t or Fed prescriptions or manipulations. Such as (but not limited to) monetary or fiscal policy. Cycles wax and wane, and it seems to me that the Gov’t or FED usually amplifies or exacerbates the cycle “THAT IS” . So, given your fear of history repeating, the Fed can never tighten and must always loosen monetary policy, because to do otherwise would be repeating the 1937 “mistake”. That’s the same excuse used from 2011 to 2013 when the Fed should have normalized policy but didn’t – now we are in a liquidity death spiral. The gravitational pull of the money printing black hole has a firm grip on us now and it’s too late to escape it’s powerful force – that time passed years ago. Money printing begets more money printing, once you start it’s impossible to stop – name one society that began money printing and later managed to stop before destroying the currency. By 2011 the monetary system was no longer in danger but Ben kept on printing – it made him popular and it’s paying off for him now as he collects enormous pay checks for doing nothing. I hope at least history will rightly assign the blame to Ben for our destruction – but I won’t hold my breath. History is written by the victors (those with the wealth) and ol Ben did right by those people. Heading to Italy in a few months. Hoping the dollar is headed up, up, up. Just wait. When the Fed raises rates some more and the balance sheet continues to reduce, expect the weird ‘central bank parity printing effect’ to go away, possibly strongly. After the Fed balance sheet goes down a trillion or so, the $ will go up and the rest of the world will plummet in relation to the $. Imports into the US will be cheap followed by cheaper and even cheaper yet. As an aside, the ECB will probably find new reasons to print even more to compensate for the shrinking value of the euro. Interesting times ahead for them. Then again, if the Fed raises rates and reduces the balance sheet significantly, the cost of imports to the eurozone will rise and the ECB will finally have inflation. Next comes the big decision … how to kick the can of the Eurozone paying its way using actual money coming from real people. … rather than the ECB and printed money, debt monetization, and negative rates. What a mess. I don’t know, other than my faith in more kick the can in new and imaginative ways. What would have cost a couple of billion euros to solve when Greece originally had issues years ago has morphed into a problem that puts the entire continent in the brink of financial apocalypse. All due to kick the can and the ability to print money and monetize debt. Interesting times ahead. Thank the business press and the economics profession for allowing it to continue. A money saving tip: use a credit card that does not charge a 3% international transaction fee. Many do but some don’t. Hey folks – we live in a totalitarian oligarchy. Where private central bankers manipulate the currency in complete secrecy, for the benefit of them and their “friends”. I wasn’t aware that Elizabeth Warren held sole veto power over whether the Fed is audited. The Fed has no interest in their dollar, its way down in their charter. Trump wants a weak dollar, that’s our policy. Rickards says the dollar has nothing to do with trade, it has to do with interest rates and policy, ahhhem. At some point the Fed will sheath its monetary wand over Fiscal policy concerns, (stimulus package). Bernanke found, when he was forced to defend the dollar (at least with his lips) by W Bush,that the Fed is not independent, and going ahead its subject to pressure to accommodate national policy, where its interdependent role with the global banking cartel may conflict. “The Fed is not independent” – that’s an understatement. The Fed is 20% controlled by politicians and 80% controlled by the financial system (investment banks, hedge funds and the rest of the cesspool). The Fed always votes to enrich the major players in the financial markets. After all it is the large money running firms that profit and in return they provide ex-Fed members with “employment” providing unusually high pay packages (quid pro quo) for doing little if any productive work. You tolerate this corruption so why should they change. BTW Ben Bernanke is collecting fat paychecks from Citadel Capital for “advising managers on financial regulations”. Why is this corrupt revolving door legal? Because you tolerate it. The dollar will bounce exactly as you say. Its current weakness is only a temporary and artificial lull. China alone, with its huge but shrinking supply of U.S. Treasuries, is capable of bringing about the kind of dollar weakness we have seen, but only for so long. Eventually, China will have to end its reliance on the dollar to maintain its financial system, hopefully before the dollar starts rising in earnest. But more likely, it will be forced to do so at the worst possible moment. You wrote>>>>>>>> dollar will bounce exactly as you say. Its current weakness is only a temporary and artificial lull. China alone, with its huge but shrinking supply of U.S. Treasuries, is capable of bringing about the kind of dollar weakness we have seen, but only for so long. Eventually, China will have to end its reliance on the dollar to maintain its financial system, hopefully before the dollar starts rising in earnest. But more likely, it will be forced to do so at the worst possible moment. The dollar may get a small, temporary bounce, but it just sliced right through the H&S neckline like it was not even there. The Euro about to take out its late summer high……. Look at the rally in gold…….Sorry, the dollar entered a bear market months ago. All of the currencies are falling in tandem. Their values will always oscillate relative to each other but the fact is they are all falling together. While someone worries about the Euro exchange for their European vacation the cost of an ordinary house is now out of reach for many workers. How can inflation be less then 2% if people can no longer afford necessities? Fed lies and Orwellian double-speak. This is some of what happens when the US debt keeps increasing like the belly of a compulsive eater who lives next to all you can eat buffet. Consider this : Inflation may well come in consumables (overdue) while assets and financial investments massively DEFLATE, simultaneously. Time for the top .01% to give back some of their FED-induced, and ill-gotten, (IMO) gains. IMO again, the top .01% (financiers and rentiers, most of them) produce nothing of tangible value for the overall economy. Just one example, what real value does an LBO, that strips assets (which go to the financiers) and leaves the productive company saddled with debt — what real value does that LBO provide to the economy ? When the masses finally awaken, it will be pitchfork and torch time. All IMO, of course. History tends to support my opinion. I’m a rentier and produce something of tangible value, namely a place to live. Try a tent rather than an apartment as a living arraignment. Time to stop bashing investors in capital rather than nonsense like Bitcoin. I did say “most of them”, which was exceptionally clear. And you have no idea whatsoever what I think of Bitcoin. I was “bashing” the rentiers, who, through financialization, skim from those who consume, and also those who produce value like yourself. I suspect you are a hard working person who is not in the upper .01%, the true rentier class. I’m skeptical. If this is happening up front, the Fed is moving behind the scenes–or not so behind the scenes–to counteract it. Any time shadow margin shows signs of collapsing, the Fed will move to counter it. UP to a point. However, it’s only a matter of time before the margin call on the Fed becomes too much. Then the game is up. That’s why Powell was chosen – to deliver the bad news. This time, the Fed won’t hide behind the notion that the data show no need for additional liquidity. Everyone knows that that won’t fly. It will simply be that the demands of the shadow system are so enormous that meeting them would amount to a fascist coup–flat out corporatism, Mussolini style. That’s when the class war begins in earnest, because that’s when the supply chain starts to collapse. The shadow system is a terminal cancer which has reached into every part of the on-the-books system. We don’t care what the Fed’s think. Americans must DEMAND the Fed’s unwind their balance and raise interest rates by petitioning their government reps. So let’s get back to why the Fed was created in the first place. Banks created money far in excess of their gold reserves. The economy would start going a little south and wealthy depositors would want to exchange their bank notes for gold to weather the storm. The banks wouldn’t have enough gold, that would start a run on all the banks, and the economy would go into depression because the banks couldn’t loan to businesses to meet their inventory and payroll needs. From the civil war to the Great Depression their were a dozen or so significant economic depressions, which caused massive disruption to industry and workers. So the thought was, centralize all the gold with the government through the Federal Reserve, and they would have enough to always back stop any bad bank. So their would be no more runs and depressions! Bad call though. Buy believing the economy would no longer go into depression, businessmen started doing crazy stuff like paying a fortune for swamp land in Florida and running the stock market up to crazy numbers. And then the Great Depression happened. And even the federal reserve didn’t have enough gold to pay off all of the bad debts that had been created. The whole country went bankrupt. Thousands of people actually starved to death. So the federal reserve simply created fiat by no longer making the paper dollar convertible to gold. Now it could always stop a bank run if it wanted to. And we haven’t had a real depression since. Even our recent Great Recession was hum drum by the standards of the early 1900s. My point being that ending the federal reserve would have other consequences. And Free Markets have not been necessarily friendly to the lifestyle of the average American. Personally I like the philosophy from the 1950s and Eisenhower: regulate almost nothing except banks and financial institutions. Let business run wild, but keep your heal on the throats of bankers and financiers at all times. Bill Clinton lead the effort to deregulate the banking laws in this country and it has gone to heck ever since. Clinton was the POTUS in Office. The REPUBLICAN’S lead the effort to deregulate the banking laws in the US, and it has gone to heck ever since. They had a VETO PROOF MAJORITY. What Clinton did, was have some of their Deregulation crusade Softened, it was all he could do. PUT the Blame where it belongs. Not on the Soft Partisan target POTUS. Clinton did initially veto the Senate Bill in May of 1999 which passed 54 to 44, but it was rewritten, primarily by Neal S. Wolin who was at that time ‘General Counsel’ to the Treasury and a staff member of the U. S. National Security Council. Larry Summers and Robert Rubin also had a great deal of influence on the Clinton-approved rewrite of the GLB-Act. On 4 November 1999, it passed the Senate 90 to 8! On that day, it passed the House 362 to 57 with 155 Dems voting Yea, 51 voting Nay, and 5 not voting. “PUT the Blame where it belongs.”??? Who had no choice, but to sign something he was against, with a house and congress duopoly, owned by Corporate America. Again this goes back to the insanity of the US Constitution, which Enshrines the “Duopoly” and so Corporate Americas ability to own it. There is nothing worse than Republican Partisans, beating a dead horse, for something it did not do, as perpetrating their lies, makes them feel good. Repealing Glass Stegal was suicide, and insanity. Clinton was, and is not, the Instigator of that. Along with the Associated Financial deregulation. So Stop pushing the Republican lie. “The Gramm-Leach-Bliley-Act is major achievement that will benefit American consumers, communities, and businesses of all sizes. 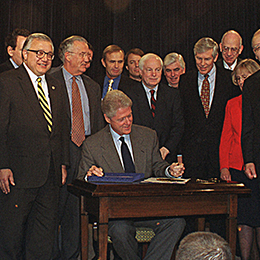 I thank all those individuals who played a role in the development and passage of this historic legislation.” William J. Clinton, The White House, November 12, 1999. And to clarify the record, I was first eligible to vote in the Presidential election of 1980. I have never missed a vote in my life and I have never voted for a Democrat or a Republican in a Presidential election. Excellent point and well made. David Stockman/Zerohedge pointed out something the other day that resonated with me. The question is who on earth will buy them? no one they will simply mature and will not be rolled over—- in their present form, while Treasury will still need to finance the deficits due to tax cuts and runaway spending, so new bonds will be issued but in no way will they have same cusip numbers as the bonds the Fed is retiring. How is UST is going to float new debt (and lots of it) while the Fed is retiring corporate debt, or UST issued in place of bad assets, now that the assets have regained their former value. Did QE represent a liability on the USG balance sheet? It wasn’t monetized to pay USG expenses, and the assets are no longer impaired. The Fed isn’t selling this paper so direct competition with itself in the secondary bond market is not a problem. Most likely there will be new corporate issuance to compete with the supply of UST hitting the market and it might get frothy. Corporate yields will be better, they can issue junk because the Fed has an open guarantee to indemnify their bad paper. USG might have trouble getting their paper off the ground. (NIRP) Why buy low yield treasuries when high yield corporates are guaranteed with risk free UST? The history of America is the struggle to keep business and government separate. There are four historic events that really matter for today’s USD and the modern-day US economy. First, in 1971 Nixon decided that nations that had lent money to the US by buying US “treasury” bonds could no longer redeem those bonds for physical gold. Nixon was forced to do this because for several years US taxpayers could no longer pay “up front” for the US’s wars for war-corporations’ profit and worldwide de facto USD “reserve currency” hegemony. (Taxpayers still can’t pay up front.) Therefore, the US had (has) to “borrow” the money from other nations by selling to them US treasury bonds which those nations could at their maturity return to the US for either more paper or, most importantly, physical gold. In short, because the US did not have enough physical gold to send to those nations who wanted gold rather than more paper, again, Nixon was literally forced to do what he did or stop making war on the world. explain most of the US’s military behavior around the world, and in particular, recently in Afghanistan, Iraq, Libya, Syria, Yemen and Somalia. In very early October 2017, for the first time ever, the Saudi King flew to Moscow and met with the head of the Russian Federation, who just happened to be Vladimir Putin. even though Iran was NOT violating the terms of that painstakingly negotiated and detailed agreement. The King’s visit to Russia and Trump’s immediate action was no mere coincidence. “…..we have about 50% of the world’s wealth but only 6.3% of its population. This disparity is particularly great as between ourselves and the peoples of Asia. In this situation, we cannot fail to be the object of envy and resentment. Our real task in the coming period is to devise a pattern of relationships which will permit us to maintain this position of disparity without positive detriment to our national security. ……..We need not deceive ourselves that we can afford today the luxury of altruism and world-benefaction. We should cease to talk about vague and — for the Far East — unreal objectives such as human rights, the raising of the living standards, and democratization. The day is not far off when we are going to have to deal in straight power concepts. The less we are then hampered by idealistic slogans, the better. What should now be obvious even to cadavers is the wildly-flailing desperation of the US Elite and their political slaves in Washington, the European Parliament and in the capitols of their various vassal states. The EESA was/is the granite monument of that desperation for the entire world to “admire”. The de-industrialized, hollowed-out, run-down, perpetual-war-based US economy and USD-hegemony are now, for the first time since the end of WWII, being seriously challenged by other increasingly powerful nations’ economies AND their currencies AND their weapons. Things are no longer going the Superpower US’s way. China’s economy is perhaps even now larger than that of the US. To sum up, we are living in the competition of all competitions and its outcome will determine the “place” of the US economy and the “strength” and ultimate fate of the Fed’s quadrillions of printed-out-of-thin-air USD in the “international community”. IMO, the only important question is whether the US Elite will “go gentle into that good night” and develop a peace-based economy, or is it going to lead the world into a no-win nuclear shootout at the OK Corral. Nixon could have defended the dollar by encouraging the Fed to raise interest rates. But he did the opposite. He pressured Arthur Burns to keep rates low to help in Nixon’s re-election effort (1972). It’s all spelled out in David Stockman’s book “The Great Deformation”. The Trumpet psy op will placate nationalists while moving the proles closer to economic parity with Asia. Numerous bankers have warned this is coming, and more expensive energy seals our fate. just for clarification.. isn’t what you refer to as the Carter Doctrine just an extension/slight alteration of the previous Dulles Doctrine? As for your conclusion, I personally think that those in power haven’t a clue. What they see is what they believe to see.. Which isn’t the same as being able to stand back and try and actually see what’s there.. In my life I have seen very few people who have taken on a belief system, that have faith in their belief system, that then stand back and say, that they were wrong and form a new belief system. So my assessment is the most likely scenario isn’t peace. And yet their debt based system of infinite leverage is beyond repair. Hard to fund a military empire when you are broke! Just look towards the old USSR for an example of how well that worked.. I am a carpenter and I prefer a strong dollar and interest rates at least at or above inflation. Stop stealing from my hard earned money. Let other countries weaken their currencies, if their people want to work for nothing, let slavery be their destiny. I get it, weaker dollar will help our exports but thats a fallacy. I dont want to work for work’s sake, I want purchasing power. The yield curve continues to compress and the popular excuse is Bond Refugees buying the 10 but its also true (to me at least) the 2 is being shunned like its radioactive. Is this the natural reaction to dollar decline? I wonder about two things. 1. Will central banks that usually follow the US lead with regard to monetary policy continue to do so if these trends do no reverse? What will we see in the event of such a divergence? 2. Will the FED offset the next massive infrastructure bill that will most likely happen in 2018? Many Democrats and Republicans have been salivating over the prospects of this hope. Talk about a trillion dollar plan has to be at least mentioned during these FED meetings. All about relative movement. One year ago, consensus only expected US to normalise. Now, the market has become more optimistic that other countries will also normalise in 2018 that has caused USD to weaken….. Think Trump also likes to see this trend. Burn baby, burn. All the way down to nil. Interest rates are scheduled to go up…..so the dollar will strengthen….no, wait, the dollar is paradoxically going down. Well, of course, it went down since the frontrunners drove it up beforehand. Of course. Why is it difficult to predict a 50/50% outcome with greater than 50% accuracy? Why are predictions so much easier after an event happens, and they can be explained with clarity and data, yet this same data was there before the event and was ignored? How can anyone make money on a trade if your odds are less than a coin toss? I have given up on following pundits. Stay diversified, rebalance, and enjoy watching the pundits explain events afterwards. LIBOR, the paper gold market, Central Bank interventions, and the vast amounts of wealth in very few hands all demonstrate that markets function as they are directed from those On High. On occasion, this breaks down and the system goes into spasm. Up until now, since WWII the Power Elite have been able to right the ship by coordinated governmental and non-governmental interventions (think Greenspan in 1987 and again in 2000 as perfect examples on a moderate scale, and Bush and Obama in 2008-9 on a grander scale). The question now is, can they do it again, given the shear size of the accumulated problems they have created by jury-rigging the system to keep it going? I have no answer, but I anticipate that they cannot. The odds have always been 60/40 or worse (unless you are an insider) Thats why its an 80/20 game. Unless you know the rules. and stick to them, you get slaughtered. The vast Majority are talking their “book”, or talking their fees. Dont understand the game and the rules, stay away. What really frustrates me is that you can take anything from interest rates, bonds, stocks, commodities, you name it, and look carefully at the data as to what is causing a change in their value, and after careful analysis, just when you are confident enough to put money on it, you lose your shirt on the trade when it goes in the opposite direction. It is like holding a ball, telling a nearby kid about gravity, letting go, and then have it go up instead of down, then tellling the skeptical kid that there is additional data to explain what happened. Too late, your an idiot, thinks the kid. We have a QE Market. Not the “Normal Market”, we have had Historically. Therefore, Research, Annalise, the conclude based on the old rules. THEN factor in QE and the Huge volume of QE cash with no work. It’s like trading the dollar prior to, and in the beginning of QE 3 “No New’s” was “Bad New’s”. Illogical, but that’s how it was. Probably or perhaps, I should say. Dollar is (or should be) a reflection of trade balances and by my observation, most products I see on store shelves are imported. How low can they go? They say there’s a shortage of qualified labor, wonder if that’s the politically correct way of saying these candidates who became unemployed, can’t pass a drug test? In the case of Japan, when they enter a cycle of repatriation it tends to lift the Yen AFAIK. And Europe is moving towards issuing eurobonds. As stated in the article, the dollar “decline” needs to be measured against the rather more significant strengthening through 2016. Investors are catching on that Bitcoin is a scam currency, QE-to-Infinity has created unsustainable asset bubbles, and the Keynesian fraudsters at the Fed are hell-bent on debasing our currency into worthlessness. At least you can’t qe Bitcoin. Totally over valued but hardly a scam it is at least backed by an asset (blockchain) that assets doesn’t really have much of a practical use at the moment. A lot of crypto scams but think something serviceable might shake out. Blockchain isn’t an “asset.” It’s a type of database software (distributed ledger) that is “open source,” which means anyone can use it and do with it whatever they want, and modify it for their own blockchain projects. Bitcoin is backed by nothing. Whatever makes sense the opposite will happen. We see it n everything today in America where almost everything is rigged to the nth degree. In theory a tax cut should push up the value of the U.S. dollar and interest rates so of course in 2018 the U.S. dollar will crash and burn just like in 2017.